This was a totally different kind of rescue -- so different that I originally had no intention of including it here with my other rescues. This was not my typical cat-stuck-in-a-tree kind of rescue, though cats and a tree are certainly involved. 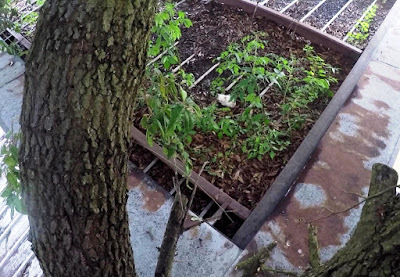 What made this case different was that there was a whole litter of kittens involved, and they were stuck, not in a tree, but on the roof of an abandoned car wash building. 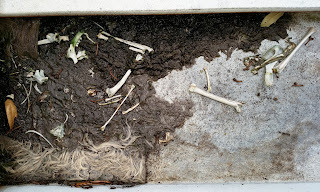 The car wash had not been used in a long time, but the building was otherwise sound. 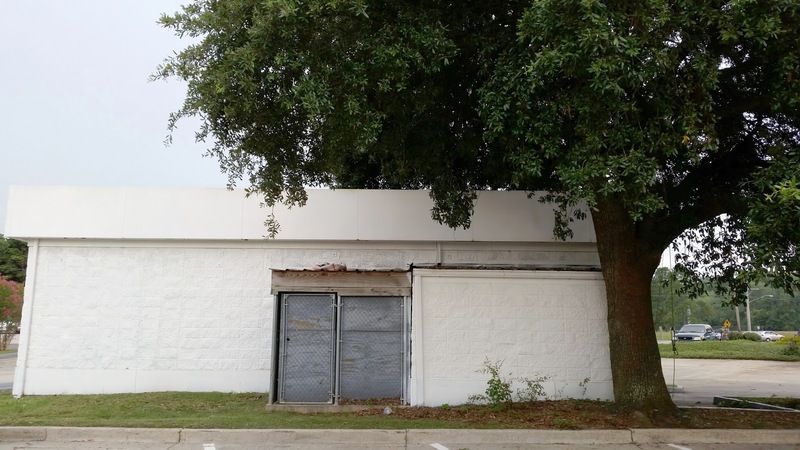 It was situated on the back corner of the lot of a busy and well-managed, modern gas station and store immediately adjacent to the back of the parking lot of the McDonald's restaurant next door. Behind the car wash was a large parking lot for a large strip mall. All these businesses were located at the intersection of a major thoroughfare and a major four-lane highway in a busy commercial part of the town. This is not a safe place for a cat to try to make a living, but there they were: a mama cat and her litter of five kittens on the roof of the car wash. Immediately next to the car wash was a fairly large live oak tree which thoroughly shaded half the roof. The other half of the roof was exposed to full sun. The tree was so close to the building that it provided easy access for the mama cat to get up and down from the roof by jumping to or from one of the large branches. It was an easy jump for an adult cat, but it was impossible for a kitten. So the kittens were stuck up there unless the mama decided to bring them down herself. We don't know for sure if the cats were born on the roof or if the mama moved them up there afterward. I suspect the latter. The roof provided an excellent safe place to raise the kittens. They were well above the reach of predators, people and cars, though they were still susceptible to hawks. But the dense foliage of the tree provided them with cover and shade from the extremely hot summer sun. 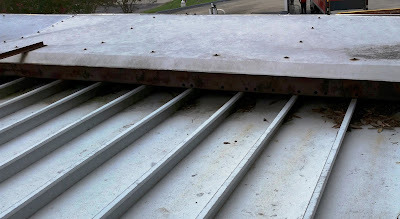 The roof had a somewhat decorative edging all around the perimeter that provided a safe place to hide and protection from the rain. While under the cover of this edging, the kittens would not be pelted with the rain though they would still have the runoff running over their feet. 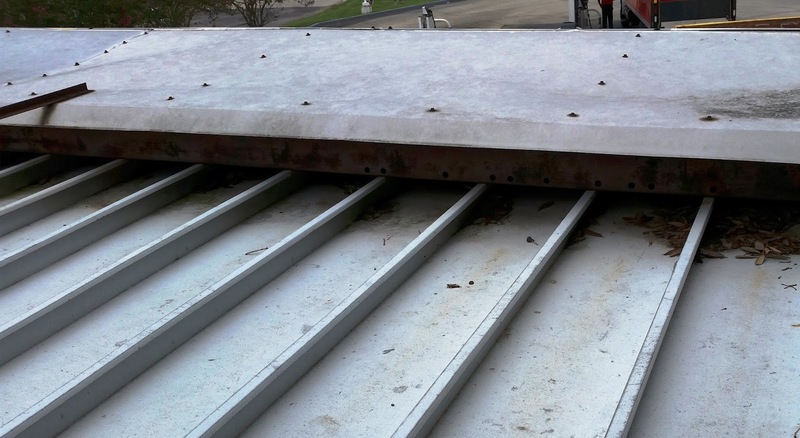 This hiding space was formidable in that it was protected by a steel beam, and the only openings into and out of the hiding area were the three inches of space under the beam and the metal roof panels. Once a kitten sensed any danger, he need only slip under the nearest opening in all four directions, and then he was both unseen and unreachable. I learned about this cat family from Brandi, a cat lover who frequented the area and had been watching the cats there and noticed the kittens poking their head over the edge of the roof. When she noticed that one of the kittens, the only solid white one, appeared to have a bad eye infection, she called me to see if I could get it down. 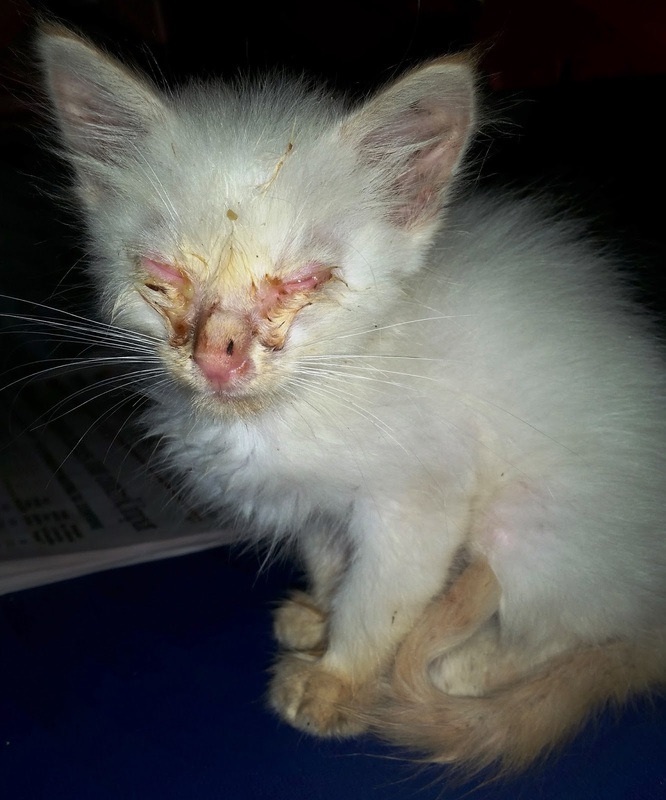 She wanted to take it to the vet for treatment as soon as possible to prevent any loss of vision. I had doubts about getting involved in this case, but I was touched by her concern and said that I would at least go take a look. And after she got permission for me, I did go out there to take a look. When I arrived, I found a few inquisitive kitty faces peering at me over the edge of the roof. The bustling activity around this area is constant, and they had acclimated to all the noise and commotion, but they still noticed if someone actually came close to this unused building. To prepare for climbing the oak tree, I launched my throw-line into the tree trying to place it in precisely the best place. I had some difficulty hitting a good spot, and in the process of doing this a few times, I made quite a commotion in the tree above the cats on the roof. A few small limbs broke and fell onto the metal roof with a loud noise. This was enough commotion to scare away any cat. When I finally got my climbing rope installed, I climbed up to get into position to see just what this cat-city-on-a-roof looked like. As the roof came into view, I saw the white kitten lying there calmly nearby as if nothing had happened, but there were no other cats in sight. 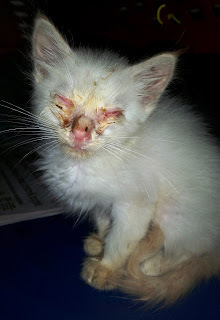 I saw how bad the kitten's eyes appeared and realized that he was still there only because he could not see me. And I assumed he must be deaf as well after all the noise I made beforehand. The kitten looked in my direction sensing something, but was not alarmed. I lowered myself down closer to him, and he continued to stay in place. I thought this would be an easy grab. I placed an open carrier on the roof immediately next to him and reached to pick him up with my hands. Just as my hand got within two inches of him, he bolted for the nearest exit and disappeared. That is when I saw the hiding area behind the steel beam and knew that there was no way I could even find the kitten, much less get him out of there. I didn't know it at the time, but I had blown my best chance at catching that white kitten. I was not too concerned, since I figured it would be easy to sneak up on him again. 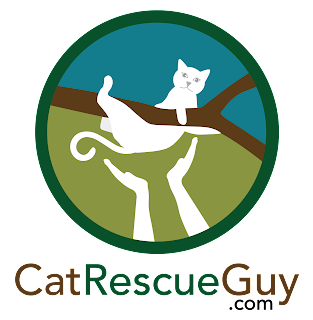 How hard can it be to catch a blind and deaf kitten? Later I would find out that he is not deaf and he had enough vision to see blobs of something out there. The next day I went back out there for a second attempt. This time I found him on the sunny side of the roof. So I quietly went out to the middle of that area with the plan to simply wait for him to emerge. He would not see me, and I would simply put my long-handled net over him. While waiting, I noticed an orange tabby paw stick out underneath the steel beam, so I knew there was at least one other kitten in this family. I waited a long time, but he never came out. I gave up and went home to rethink this. 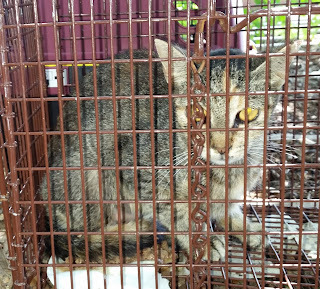 I decided to turn this case over to my TNR (Trap, Neuter, Return) friends, Suellen and Cathy, who have been trapping feral cats for many years. They could trap the adult cats on the ground, and I would trap the kittens on the roof. 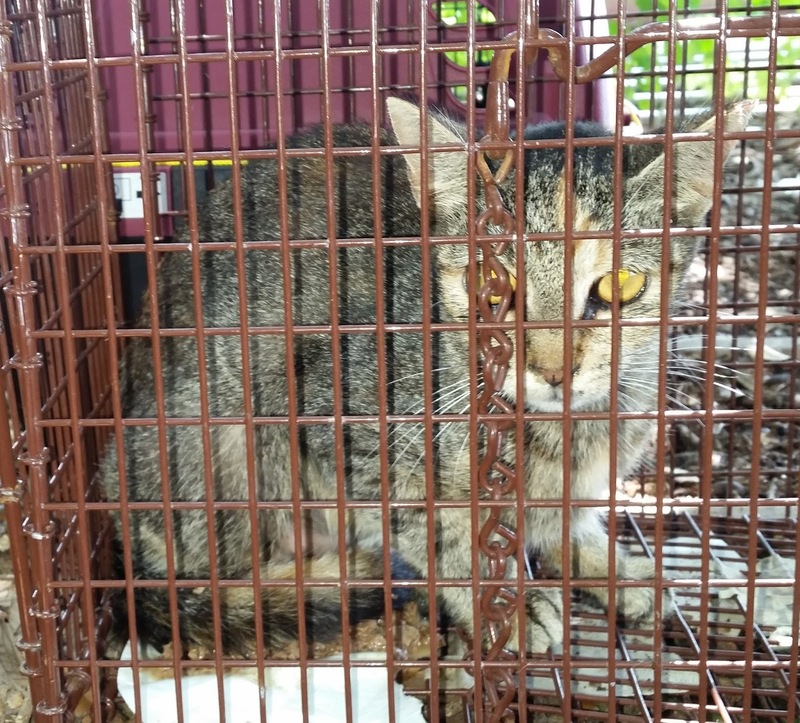 We would have them all spayed or neutered and vaccinated, and then we would return the adult cats to the same site where they could live out their life without making any more kittens. The kittens would be placed in an adoption program. A trapping day was scheduled, and I figured that would solve this problem. In the meantime, I went back out to talk to the property owner to explain what we intended to do and get permission to do it. When I arrived, I found the white kitten in a new place. 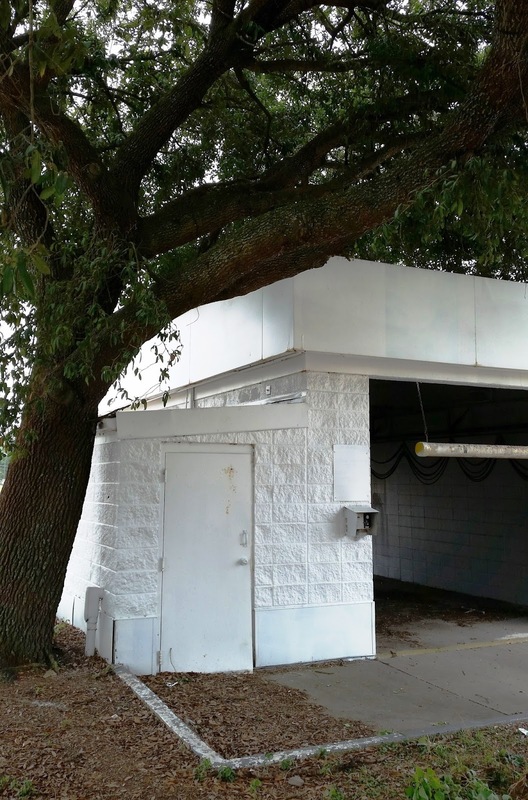 Attached to the car wash is a storage shed with a roof that is much lower than the car wash roof. In fact, the lowest point of that roof was probably only seven feet high, and at that point I saw the white kitten napping without a care in the world while the mama cat rested a foot away. While I could probably reach up and touch him, I was not close enough to grab him. All I needed was a step ladder and I could grab him, but I had no ladder or any of my climbing gear or cat handling gear with me. All I could do was look and wish I had been prepared. The kitten had probably fallen off the edge of the higher roof due to his poor vision. The mama watched over him and later took him back up to the high roof. The scheduled trapping day arrived, and Suellen and I went to work early that morning. I set the traps on the roof while she set traps for the adults on the ground. By the end of our trapping session a few hours later, we had successfully trapped a grand total of one kitten. Needless to say, this was very disappointing. 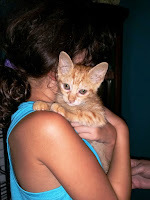 The kitten was an orange tabby girl which I will call Bonnie, seen here being held the next day by Suellen's grand-daughter, Ava. We decided we needed to try trapping again, but this time we scheduled a new trapping day in the evening. Again we went to work, and this time we did only slightly better. We caught one kitten and one adult, both orange tabbies. Again, another very disappointing result. 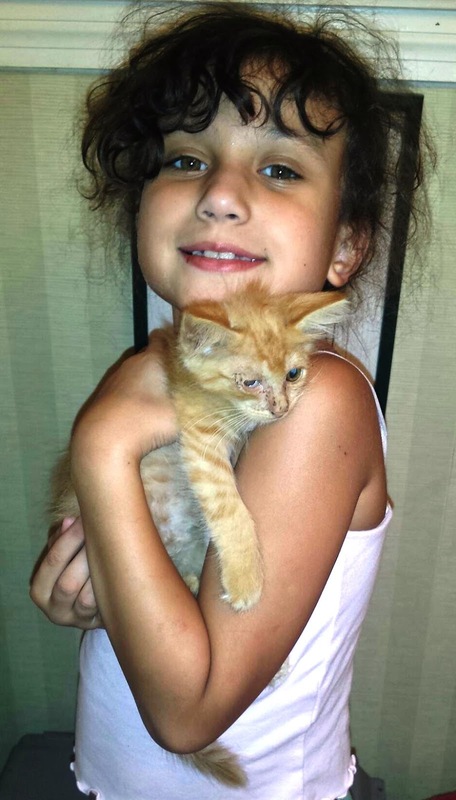 This second orange tabby kitten is shown here in Ava's arms, and I will call her Babyface. The adult cat was a male and the presumed father of all these kitties. He was neutered the next day, and I returned and released him the day after that. While I wanted to catch all the kittens and adults, the most important ones to me were the white kitten and the mama cat. I wanted to get the mama cat spayed so she would not have any more litters, and I wanted the white kitten because he seemed to be in the worst health. It appeared that all the kittens had an eye infection to varying degrees, but the white kitten looked worse. He was also smaller than the others and did not seem to be thriving. Since trapping wasn't working, I decided to go back in the morning and try just sitting quietly and wait for the vision-challenged kittens to come near me. I spent the entire morning on the roof and they never came close. At that point, I decided to break my rule about never leaving a trap unattended. I set a few traps on the roof and left with the plan to return later in the afternoon to check. 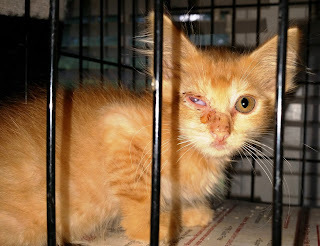 When I returned, I found Bugsy, the third pitiful-looking orange tabby kitten in one trap and the mama cat in another. This was more encouraging, but I still had the white kitten and his gray sibling left to get. The next day the mama cat was spayed, and I planned to return her the following morning. When I went back to release her, I decided to keep her in the trap for a little while longer to use as bait for the other kittens. I set a few traps for the kittens on either side of the mama cat and waited. I mounted my camera to a branch over the roof and connected it to an iPad on the ground so that I could watch the activity on the roof while being out of sight of the cats. After about thirty minutes, I watched on the screen as the two remaining kittens came to investigate and see their mama. In all the times I watched the white kitten during trapping attempts, he never showed any interest in the food. He might sniff it once, but otherwise showed no interest in it at all. Consequently, he never bothered to go into a trap for the food. I was beginning to learn that he was still in a nursing stage and had never eaten anything else before. He didn't know how to eat yet. He came out to see his mama, but again showed no interest in the food. He was more interested in just lying down close to his mama and taking a nap. The gray kitten, however, was larger and more fully developed. He looked like a normal kitten and was full of energy. He was very interested in the food and sniffed and ate all the spots of food I had placed in a trail leading into the traps. Unfortunately, we had only one kitten trap to use. All the other traps were for adult cats, so I oiled the mechanism and carefully set them to trigger with as little effort as possible. The gray cat ignored the kitten trap, but slowly ate his way into one of the adult traps. He worked his way all the way to the trigger plate and lingered a long time as he ate all the food there at the end of the trap. I kept watching and anxiously waiting for the trap door to close, but the kitten was simply not heavy enough to trigger the trap. He ate all the food and went back out of the trap. I watched as he began pestering his white brother with play that the white kitten didn't want. All he wanted to do was sleep, but the gray kitten was persistent and forced a playful wrestling match. When he had enough of that, he went back to the same adult trap. Again he went all the way back in and lingered as if hoping some more food would appear. Again, the trap door would not close. He did this five different times, all with the same result. The white kitten continued to just sleep there close to his mama. After almost three hours, the battery on the camera was exhausted, and I could no longer see what was happening. I gave up and went back up to the roof to release the mama cat. The gray kitten went back into hiding, but to my surprise, the white kitten stayed there just like my first encounter with him. I thought I might have a chance to net him after all, so I very quietly and slowly sneaked up on him while grabbing my net. I very slowly got the net in position closer and closer to him and then dropped it over him. I finally got him. I worked him gently down into the net and then released him inside a carrier. He felt so small and frail to me, and I was very careful and gentle with him. He handled it all without any complaint. I will call him Whitey. I was so relieved to finally have Whitey in hand, and I had already scheduled an appointment with the vet for the afternoon. If I had not caught the white kitten, I would have taken the worst looking of the orange tabby kittens instead. But since the white kitten was more in need of attention, I planned to take him instead. I took him home and tried to feed him before his visit with the vet. Again, it was clear he did not know how to eat yet. I got some canned pate cat food, mixed some water in it, and put it in a dropper. I pushed it up against his mouth and squeezed some of the food out. He licked it up and wanted more. I fed several dropper loads to him and he learned to like this kind of food. Then I switched to a spoon, and he quickly learned to lick the food off the spoon. I gradually lowered the spoon into a bowl, and he continued licking the food out of the bowl. He was taming up very nicely. He cried for me whenever I left the room and liked for me to touch him. He was not comfortable being held, but he liked being close. Now that I could handle him, I confirmed that he is indeed a male. He was going to grow up to be a very sweet and pretty long-hair flame point boy. I was concerned that the eye infections for these kittens had gone on too long and done so much damage that the only option was to surgically remove the eye. I was so happy when the vet told me that they should all be just fine. She gave me some antibiotics and eye drops for all the kittens and, with that, a great sense of optimism that they all would be well after all. But I still had that one, last gray kitten to catch. I went back out the next morning and set the kitten trap on the roof for him. Again I set up the camera and watched below for him. This time, there was no sign of him or any life at all on the roof. I watched and waited for almost three hours again until the battery died with no sign of any life up there. After thinking about it, I realized I had been foolish to think that he would still be there. After all the trauma the mama cat had suffered in being trapped and spayed and then seeing me net her white baby right in front of her, it would make sense that she would move her last remaining baby to a new place. It would be clear to her that the roof was no longer a safe place to be, so she did what a good mother should do. She moved to a safer place. I have no idea where they went. The joy I feel in the successes of this ordeal is tempered by the sadness of being unable to catch that last gray kitten. The mama cat was a good one, and I hope she found a safe place to go. But looking around there, it is hard to imagine any safe places for a cat to go. But then, she did find the car wash roof, a safe place I never would have considered. Perhaps she would find another creative solution. 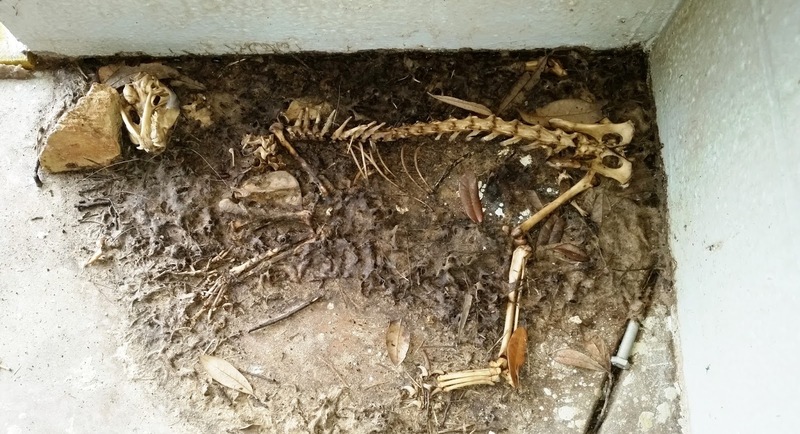 These feral cats often live a quietly difficult life. 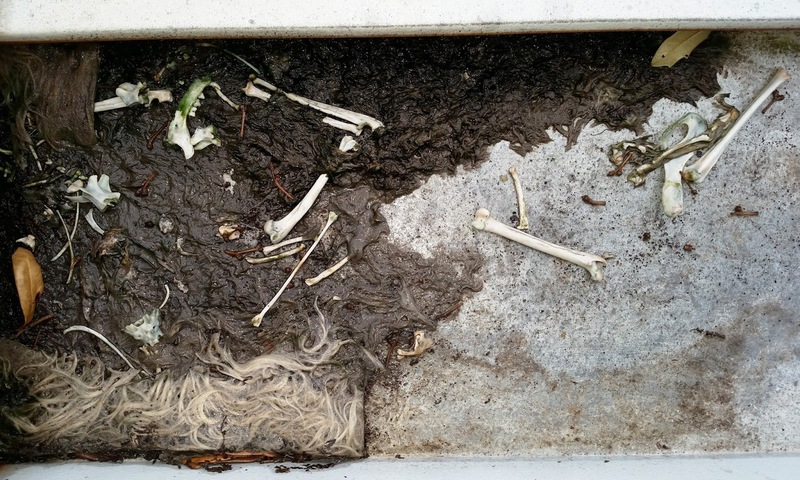 On the roof of the car wash, I found the scattered bones of another adult cat whose story we will never know. We don't know why he died or how he suffered. 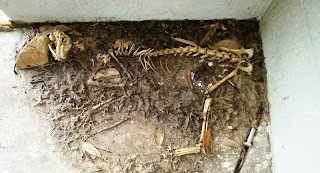 Down on the ground below inside the car wash enclosure, I found yet another complete, intact cat skeleton lying in the corner with his head leaning against a brick -- another unknown story of lonely suffering that no one saw or knew even while hundreds of people were passing by daily just a few steps away. At the same time and in the same place that we see these images of death and suffering, we also see the life, joy and promise of a litter of kittens. All four of these kittens are together in Suellen's care while they are returned to full health. They are all taming up very nicely, and when they are large enough, they will be spayed and neutered. Once they recover from that, they will be available for adoption. I will update this story when that time comes. This was a very difficult case. Not counting the times I went out there to prepare for trapping, I made nine trips to the site to attempt to catch these cats. Each trip required that I climb and descend the tree at least twice, sometimes three or four times. The heat, even in the shade of the tree, can be unbearable, and I have never sweated so much in my life. Even my pants were so soaked that my belt and wallet became soaked, and the cash in my wallet was so soaked that I had to air it out to dry -- a pleasant thought to remember the next time you handle cash. But when I look at those pitiful, sweet kitten faces, I know it was all worth it. And when I think of the future litters we have prevented from suffering in such an inhospitable place, I feel good about it. I just wish I could have caught that last gray kitten. I will always wonder about him. Will someone one day find his skeleton and wonder about his story? All the kittens have been improving. The eye infections are gone in two of the kittens, and they are much improved in the other two. Unfortunately, Whitey did not look well this morning. He appeared fine last night, but this morning he was lethargic and his breathing was labored. I took him to the vet right away, and there we learned that his temperature was very low at 97 degrees, and the vet also noticed the breathing difficulty. They took him to the back to get a blood sample, but he started flailing about which was a sign of breathing trouble. They put him under an oxygen tent, but that did not help enough. They put a tube down his throat to help him, but that, too, did not help, and he died there on the table. We don't know with certainty what was wrong with him, but it is likely that he had pneumonia. Cats hide their illnesses well, and Whitey suffered silently and hid it until it was too late. I brought him home with me and buried him under the big sweet olive tree in my back yard. The poor little guy never had much of a chance. He was such a puny runt compared to his larger, healthier siblings. At least he got to enjoy some loving from me and his foster mom, Suellen, and some relief from his eye infection before he left us. He lived a little bit longer than he would have had I not caught him, but it was still a pitifully short life. He touched my heart, and I am very sad to see him go.